The Royal Canadian Mint have launched (8th August) a new silver coin which marks the birth of HRH Prince George of Cambridge, first-born child to Prince William, the Duke of Cambridge and Catherine, the Duchess of Cambridge. H.R.H. Prince William and Miss Catherine Middleton met while studying at the University of St Andrews in 2001, little did they know that they would become the world’s most popular bride and groom. Indeed, their runaway popularity was confirmed when thousands of people filled the streets of London and millions tuned in to watch their wedding on April 29, 2011. The next exciting step in a young couple’s life was the arrival of their first-born on the 22nd July 2013. The announcement that the Duke and Duchess of Cambridge were expecting a baby in July 2013, this news was met by their adoring public with great joy, eager for the exact date and an insight whether their new baby would be a boy or a girl, and of course, what the baby’s name would be. Ultimately and regardless of the baby’s gender, the royal infant would be third in line to the throne and its birth is being celebrated with all the ceremony befitting a new member of the Canadian Royal Family; and the first to usher in a new generation of royalty for the 21st century. His Excellency the Right Honorable David Johnston, Governor General of Canada unveiled the beautifully designed collector coin celebrating the birth of His Royal Highness Prince George of Cambridge. His Excellency was joined at the event by the Honorable Shelly Glover, Minister of Canadian Heritage and Official Languages and Mr. Ian E. Bennett, President and CEO of the Royal Canadian Mint. 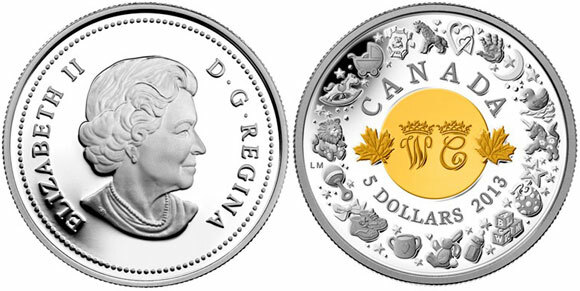 The coin was designed by Guelph, Ontario-based artist Laurie McGaw. The reverse image features a selective gold-plated monogrammed “W” and “C” with crowns, representing the cyphers of the Duke and Duchess of Cambridge, flanked by maple leaves. The coin’s outer edge depicts an ornate ring with all the accoutrements of life with a new-born: baby rattles, plush toys, bibs, soothers, sippy cups and tiny shoes and socks intermixed with moons and stars. The year “2013” appears below the initials and the word “CANADA” above to highlight the close relationship Canada shares with the Royal Family. The coin will be available for dispatch after the 23rd August, limit three coins per customer. For more information on this and other coins offered by the Royal Canadian Mint, please visit their website at: http://www.mint.ca/store/coin/fine-silver-coin-royal-infant-with-toys-2013-prod1690039 Information offered in both English and French – international orders fulfilled.